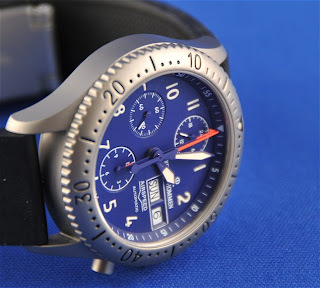 This is a review of my Revue Thommen Airspeed Classic Automatic Chronograph. That was a mouthful. I got this watch by chance (a year ago). I as at a local mall when I saw this watch. I was not really interested even though it was 70% off retail. The mall was clearing stock and they were selling some watches at great discount. I thought it was a watch with an ETA 7750 movement. I already have a watch with an ETA 7750, so I did not want to get another. A quick glance and I left the mall. At home, I wondered about the watch and the brand. 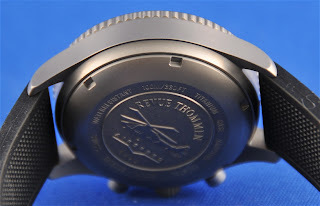 I was not familiar with the brand Revue Thommen other than it made instruments for planes. So I looked into the Internet. I found the brand but I did not find the watch in their catalogue. So I pressed on and finally I found the watch. Lo and behold I found out it was powered by the famous and popular Lemania 5100, the very movement I was looking for. I immediately changed and went downtown again (a good 30 minutes away). Finally got to the mall and rushed to the watch section. The watch was still there. Great. Finally bought the watch for a princely sum of USD 490. I am as happy as can be for a NOS watch that is a about 10 year old. Well enough of the history, on to the watch. The case is made of titanium and it has a matte finish. It is very well made and the finish is top notch. You can see the quality in the watch. The watch itself is rather small. It measures 38.5 mm in diameter and is 14.8 mm thick. I believe this is the smallest watch fitted with the Lemania 5100 movement. It is very light as it is made of titanium. It weighs in at a mere 62 grams (movement 21 grams). With the crown, it is 41 mm across and 45 mm lug to lug. The lug width is 20 mm. The matte finish of the case does give it a stealth look. The screw back is also made of titanium and the finish is just awesome. 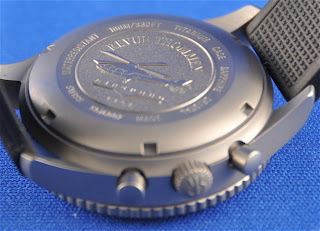 The case back, which is screw-down is decorated with a stylised helicopter logo in the center. Just below the logo is the serial number. I just love watches that are serialised. Why? I don't really know. Around the logo, we find the usual text: model number, water resistant rating, case and crystal material (titanium and sapphire) and where it is made (Swiss). The buttons on the watch is just as good. 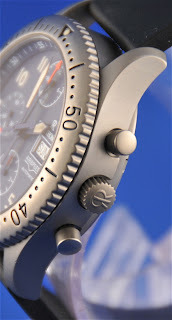 The design of the buttons, more so the chronograph buttons, with its exposed stems, gives the watch a very retro look. The crown is of the screw-down design. It is 5 mm in diameter and 3 mm thick. The crown is rather small for an aviation styled watch as the small crown makes it difficult for pilots with gloves to use it. The bezel on this watch is rather unique. Instead of having the usual 0 to 60 markings clockwise, this watch has the markings anti-clockwise. This means that you can use the bezel as a countdown timer. How cool is that? Basically, if you have to do something is say 12 minutes, all you have to do is to align the triangle to the minute hand and wait for the minute hand to reach 12 and you can do what you have to do. 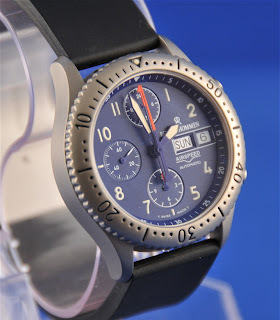 The makes it easier for the pilot as he does not have to remember the time to, just turn the bezel and he is ready. The bezel is uni-directional and takes 120 clicks to do one complete rotation. Oh yes, the bezel rotates counterclockwise as well. The pip at the 12 o'clock position is lumed. I also like the fact that the markings are engraved into the bezel and not printed on. This means it cannot rub-off. Now we talk about the very reason I bought the watch. 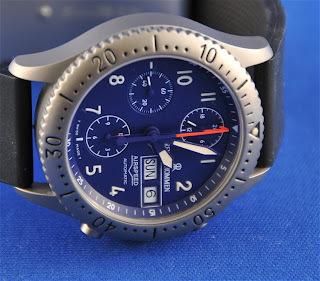 I just love watches with the chronograph function (sadly I have 3 if we don't count the digital watches). So since I already have the ETA 7750, I was looking for its peer, the Lemania 5100. What can I say about the Lemania that has not been said in other review of this fine movement. It is a movement that has been around for over 30 years. Sadly I do not have a photograph of the movement. This movement is favoured by the military as it provides easy readability. Having a centrally mounted minute and second hand makes reading the elasped time easy as it is not on some small sub-dial. Also its robust construction provides for minimal service requirements on the field. That and the fact it may be one of the few movement out there that can withstand 7G without the sweep second hand stopping. Some may question the use of the 24-hour sub-dial. Well when you are working in the Alaska or further up North or very very South, where the daylight time is minimal at best, it is a great thing to have to tell you if of it is day or night and when to go to bed. I also find it a very important tool to have when I am adjusting the day and date when the watch has stopped for some time. At least I know that if the watch is between 10 pm and 2 am, I should not adjust the day and date least I damage the movement, as in most mechanical watches with day date or date function, the calendar change mechanism engages about those time and adjusting the calendar can cause damage to the movement. This watch has a blue dial. I would prefer the black dial, but beggars cannot be choosers. The dial is matte, which I like. I would prefer if the chronograph sub-dial had a tri-compax design, but in wanting the Lemania 5100, I have to forgo this requirement. The 24-hour sub-dial is at the 12 o'clock position. The continuous sweep second is at the 9 o'clock position and the 12-hour sub-dial is at the 6 o'clock position. The sub-dials are engine tuned. This can only be seen under a loupe. The sub-dials are also recessed. 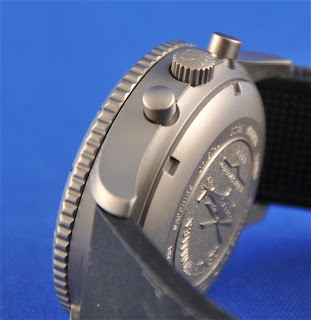 This shows the a high quality of dial construction. This can be seen in the day-date window which is recessed and beveled. The day-date window is at the 3 o'clock position and features a black on white day-date display. Above the window is the REVUE THOMMEN signature and logo. Just below the window we find the AIRSPEED legend and below it AUTOMATIC. The minute markers are on the 'rehaut' or the bevelled chapter ring instead of the dial. This makes the dial less cluttered. The hour markers are marked by Arabic numbers and does not have the usual index marks. The lume on this watch is poor as it uses Tritium (as marked by 'T' on the dial). However, the lume last a long time and is still visible under very dark condition. Not bad for a watch that is over 10 years old (tritium has a half-life of about 12 years). The luminous coat is white. The hands on the watch is of the sword shape design. It is based on the hands used on aircraft instruments. 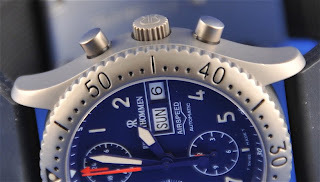 As with the dial, the hands are lumed white with the same matte blue as base. The lume is poor as the dial. The minute hand extends to the minute markers but just. The hour hand is short and stubby. At certain angle, the hands (lumed part) looks like it is floating. 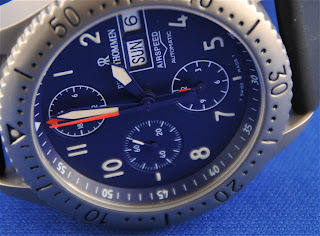 The chronograph hands are also matte blue but the tips (from halfway) are rendered in 'Day-Glow' red-orange. The second hand is differentiated from the minute hand by an arrow tip on the end of the minute hand. This set-up makes reading the watch easy. I have no idea why the counterbalance of the chronograph hands are so long. It is long enough to obscure parts of the dial. The crystal fitted on this watch is sapphire crystal. It is flat and is almost flush with the bezel. It sticks outs perhaps 0.5 mm? The crystal is AR coated on both sides. It can make the crystal 'disappear' at some angles and my wife has asked me if the crystal is missing. I do not know how the AR (anti-reflection) coating on the outside will last or how hardy it is, but since the crystal is almost flush with the bezel, I would not worry too much about it. Now we come to the only thing I did not like about the watch. 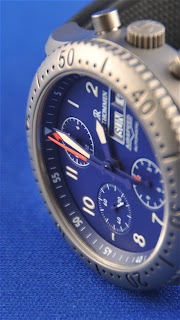 As can be seen from the photographs, the watch is currently fitted out on rubber straps (unmarked). The bracelet is well made and is very good. It is also made of titanium. However, I could not stand the 'bling' of the bracelet in that the style is very busy and the shiny strip on the center and also on both sides of the links. The links are of 5 parts, but the 'busy' look with the strips makes the bracelets looks like it is made of 7 pieces. this totally clashes with the stealth look of the watch. 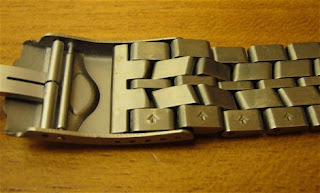 The bracelet has 7 removable links and the clasp has 5 fine adjustment holes. This provides for a lot of adjustment for the bracelet. The clasp is well made and offers additional locking. This indeed offers better security and prevents inadvertent unlocking of the watch. The clasp is signed. 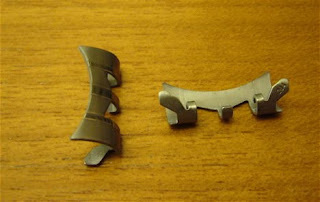 The end pieces of the bracelet is hollow and not of the solid link design. The fit is good, just like the bracelet. 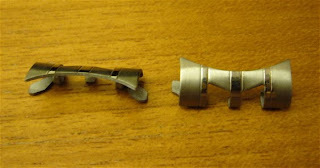 Note the shiny stripes on the end pieces. I like this watch. I got it really cheap and it has a movement that I have been looking for some time. The overall quality of the watch is great and I would position it just below that of luxury brands like Omega and Rolex. It is light to wear and sits well under the sleeves. It would be nice if the overall diameter was a tad larger at 40 mm. Would this be solved by getting one of the larger watches with the same movement? 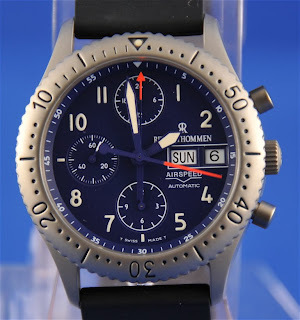 I don't think so as I would like to get a chronograph watch with a Lemania based movement and tri-compax dial design. Any recommendations? 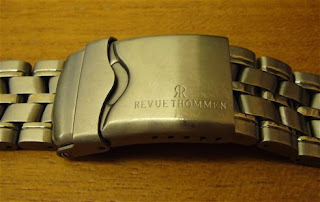 I have a Revue Thommen airspeed, non-chronograph; I like their detail. Recently got a Fortis Chronograph with Lemania 5100 movement. Solid everyday watch, with great detail. I have three Fortis watches, they never disappoint. 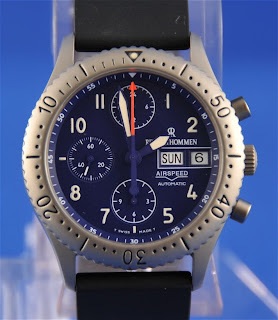 also Sinn 856, a few old militarys, including CWC chrono with Valjoux 7750, beautiful piece. 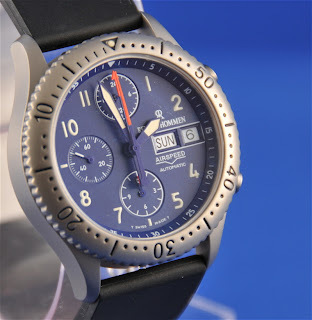 Looking at Stowa's new chrono, hard to pass-up. Welcome to the blog. Sorry for the late response. Nice collection of watches you have there. Hello, great watch, contact me if you want to sell just the bracelet. I have this exact watch and love it - the only issue is I lost a button cover, and they don't stock them anymore. Being a pilot I especially love the sword shaped hands.